Developing custom reporting can be time-consuming and expensive. According to Forrester Research, the average cost of developing a custom report is more than $3000. You need timesheet audit reporting for Project Online asap! Version 2 adds the Time Off dashboard (see below) to the product. Marquee Timesheets for Project Online enables you to quickly access your data in a form that you can easily act upon. 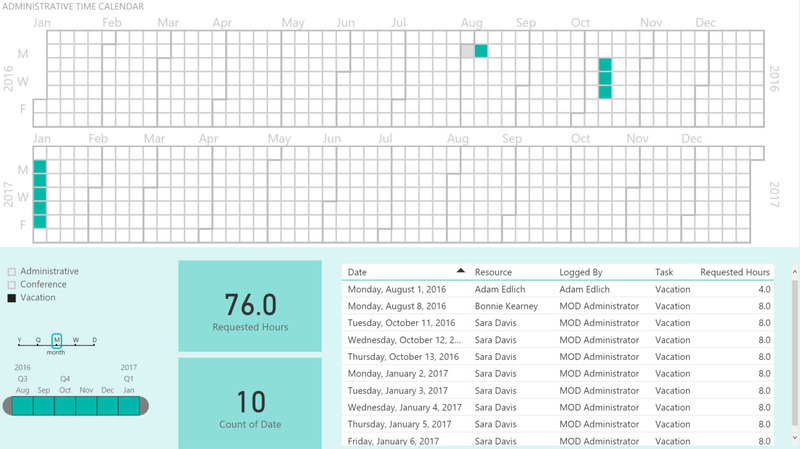 Once the Power BI data model is installed in 15 minutes or less, you can use it as is or you can extend it to create your own unique reports. This product requires a minimum of a Power BI Free license and for Power BI Desktop to be installed on your desktop. Isn’t your time and patience worth this investment? Buy now to start working with your data.